Who are we to decide on taking life of living being, whether animal or human. The concerned should try talk to our neighbors, Sri Lanka or India to take it back. We can send the crocodile by sea and I am sure this will be more cost effective then sending it all the way to Australia. If one seriously think about freeing it, then it is not a big issue. We have to talk the shipping companies to take it freight free which I am sure most of them will agree. It takes a day or two to reach these destinations. I just think it is great that you have shown you care, and are asking yourself these sort of questions. Some kids at BHIS have been learning about folktales from around the world, and in particular folktales that have a moral message in them. question should be... kill it now or kill it slowly! His bowels will make a fitting end to our harlots and their blasphemous offspring. Alhamdulillaah! I propose we promote the Kimboo to State Executioner, and let it feed on the tyrants that have caged us today with their greed. Hawwa Lubna spoit the whole article by giving out killing as an option. Free Kinboo is all very well. But killing it? That's downright brutal and goes against the spirit of the article. Guess what DHL always get order like this. They are experts in shipping whales and other animals. These sluggish burocrats can't do anything right. at this point, the best thing for the kinboo seems to be euthanasia. rehabilitation may no longer be an option. too late for that? anyways, this is not the only kinboo here. it was back then, but not anymore. what happened to the other ones? but what do we achieve by killing it? we are not exactly the type of people who care about where our chicken come from. we just check if there is 'halal' written on it and we it without even thinking for a second about what those animals suffer. numerous cats, hungry cats running around city and dying on the streets, nobody cares. but one life, is still a life. and it will be a symbol of freedom for all. If freeing it is not possible, i do not see why the second option should not be, to make is a better enclosure. I don't see why killing it has to be the only option. Maldivians love seeing the Kinboo, i don't think we would mind a few more of our tax dollars going in the way to make the kinboo celebrity a nice suitable home, perhaps even with other companions. killing it is not a good option. We should make a suitable place for it. Otherwise send it to Australia which has suitable habitats for it. For a compensation for my 15 years ileagal imprisionment without charges , I demand two additional female Jariyaa kinboo. 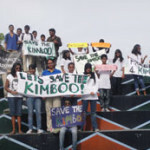 Free kinboo was not a big issue then why any action has not been taken...let say anyone have not think seriously... is this a joke... Before also this issue has been taken when cage has been destroyed by the kinboo itself and they build it again in a better way foe safety.... but is it safe still? let talk about the other option to kill it.